"Genre: Rock and Pop" -- Yes! What splendid news! I look forward to the release of this and the other forthcoming releases. 05 Where Have They All Gone? Are these albums actually on sale yet? I couldn't see anywhere on the Demon website to buy the CD's. Hi Al -- nice to have you with us. No, not on sale yet. Provisional release dates are in the February/March period. Pete went into more detail in his latest newsletter, reproduced here. 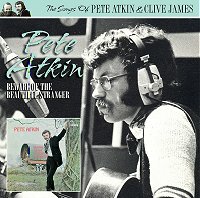 It will be good to be able to buy Pete's albums at reasonable prices; ebay prices have been way too high! Looking forward to getting King At Nightfall on CD at long last! Not long to wait now -- the first two (single) CDs are scheduled for release on February 2nd, with the remainder (2 double CDs) on March 2nd. I've placed copies of the Edsel promotional sales sheets for the first two albums on the Smash Flops home page. Amazon have left the last word off each title, and have sales notes but no tracklistings, whereas HMV have tracklsitings but no notes, and mention a "Clive Davis". Is the Hillside Shop likely to be able to take advantage of this merchandising opportunity? Amazon also now has 'A King At Nightfall & The Road Of Silk' and 'Secret Drinker... Plus & Live Libel' both for £7.79, for release on 2 March. No track lists posted yet. Just think - that means you could get all four (six) albums for under £30! Yes, Jan, all the new Demond Edsel releases will be available via the Hillside onlilne shop as soon as stocks are available. Well, yes, that was at least a part of the thinking - if the original versions were to have remained unreissued, re-doing them at least made sure that the songs could continue to be available and under my control. Doing them a bit differently was an extra justification, I hope. So with the originals all out there once again, doing them a bit differently becomes the primary reason for revisiting another batch. And there are certainly enough that I'm doing differently enough these days for a Volume Two to be a realistic prospect. It's just that to do it as my very next project feels like a bit too continual an emphasis on the past. We'll see. Watch this space. Thanks Pete and Amen to that; New songs first, gorgeous re-creations of older ones to follow in due course - with Simon Wallace hopefully - that'll be fine thanks! To the person who doesn't know Mythical America (but knows Beautiful Stranger), well, you're in for a treat, I'd say. Beautiful Stranger is a good record, but Mythical America is a great record; rich, complex, subtle.